A short focus on core and glute med strength followed by a relaxing stretch of the middle area: hamstrings and hips. No gear required. Non-sweat workout. 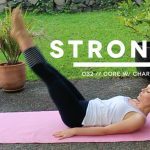 This entry was posted in Strong Workouts, Uncategorised and tagged core, stretching, strong. Bookmark the permalink.